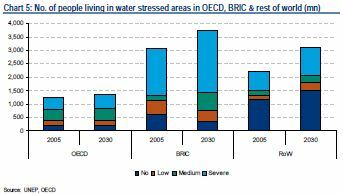 Water is the new oil, and water stress is a defining global megatrend of the 21st century. 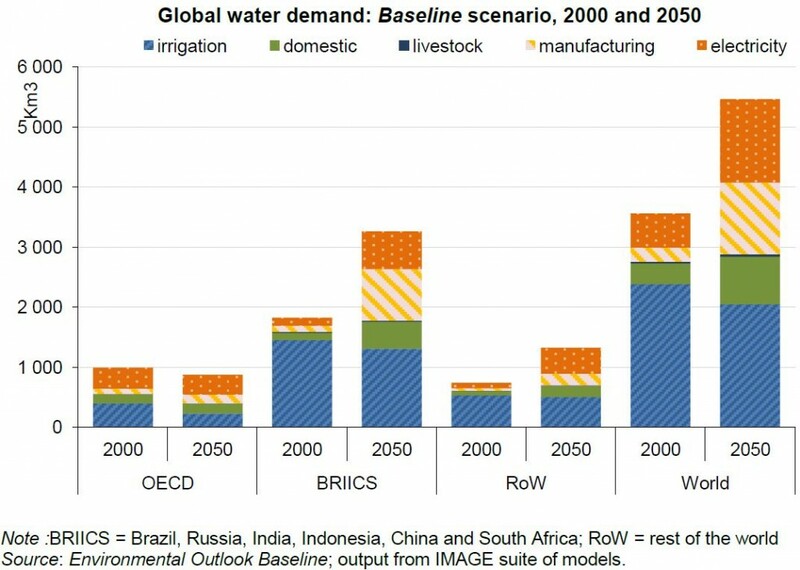 By 2030, global water demand is forecasted to surpass supply by 40 percent, leaving close to half the world’s people with too little of the liquid gold. Deep-pocketed investors ranging from China to Goldman Sachs to T. Boone Pickens have moved quickly to accumulate billions in water-related investments. From foreign aid to infrastructure and land deals, the explosive global issues related to water consumption and water scarcity are shaping the actions of governments, companies and financiers around the world. Today, about 2.8 billion people battle conditions of water scarcity in which they are unable to access needed water due to infrastructure or financial limitations. By 2030, hundreds of millions more residents of the BRIIC countries (BRIC Countries + Indonesia) will inhabit areas with medium or severe levels of water stress. The chart below from a new report “A Blue Water Revolution – Global Water” by Bank of America Merrill Lynch (BAML) shows the increase in global water stress from 2005 to 2030. It takes 1,000 to 3,000 liters of water to produce just one kilo of rice and 2,000 to 5,000 liters of water to produce one person’s daily food requirements according to the Food and Agriculture Organization of the United Nations (FAO). Agriculture already accounts for about 70 percent of all global water consumption, and the FAO expects global demand for food to increase by 50 percent by 2030. About 40 percent of world food production comes from irrigated agriculture, which increases the yields of most crops by 100 to 400 percent. 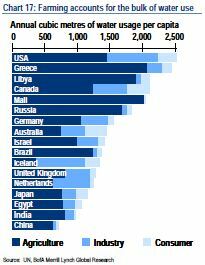 The chart below from BAML shows how food production takes up the lion’s share of water use in many countries around the world. In the BRIIC countries alone, the water needed for manufacturing and electricity generation is forecasted to increase by more than 720 and 370 percent, respectively, by 2050. Depending on the sector, water can be a raw material and a final product, as well as an essential input for cleaning, heating, cooling and power generation. The International Energy Agency (IEA) expects global energy demand to jump by 50 percent by 2030 and the water consumed by energy production to double in 25 years. Driven largely by China and India, coal could surpass oil as the world’s main energy source by 2017. 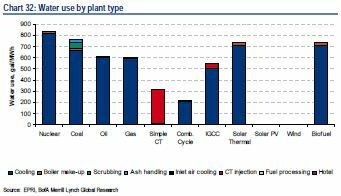 Generating electricity from climate-altering fossil fuels like coal and oil requires large quantities of water, primarily for cooling, as shown in the chart below from BAML. Based on current trends, the amount of water consumed to produce electricity from coal would skyrocket 84 percent by 2035. While better for climate and public health, some new biofuels are even more water-intensive. Solar photovoltaics (solar PV) and wind energy (the empty columns in the chart above) offer a striking sustainability advantage over other energy sources. Along with having minimal impact on climate, these clean, renewable energy alternatives require no water to generate electricity. Residential and municipal water consumption accounts for the remaining piece of the global water consumption puzzle. China plans to pour up to 40 trillion yuan (US$6.4 trillion) into building cities and towns in the next decade. The Asian Development Bank (ADB) figures cities in developing countries across Asia need to add – every day – a total of 20,000 new dwellings, 250km of new roads and infrastructure to deliver 6 million more liters of potable water just to keep pace with economic development. In the largest cities in developing countries across Asia and Latin America, 25-40+ percent of water is typically lost to leakages according to the Green City Index developed by the Economist Intelligence Unit for Siemens. In certain areas of Europe, as much as 50 percent of domestic water just disappears in leaky distribution networks. Climate change threatens to exacerbate water stress and shortages. A relatively conservative 2°C increase in temperate over preindustrial levels could lead to a 20-30 percent decrease in water availability in vulnerable regions such as Southern Africa and the Mediterranean. These insights point to a number of opportunities to improve global water conservation. Food waste – The massive water demands of food production highlight the critical need for a more efficient, sustainable food system that minimizes food waste. About one-third of the food produced for human consumption is currently wasted or lost according to the FAO. Manufacturing innovation – New manufacturing processes and facilities will have to be more efficient. Alternative cooling methods should top the list of conservation efforts. Renewable energy – No other energy sources can compare with the negligible environmental impacts of solar and wind energy. Leaky urban infrastructure – Fixing outdated infrastructure and ensuring water conservation is designed into new cities can help curtail wasteful water losses. Japan looks like a good model, with water system leakages ranging from just 3.1 percent in Tokyo to 5.5 percent in Yokohama and 6.9 percent in Osaka. Foreign policy – Governments should carefully rethink land- and water-related policies and monitor investments with an eye toward responsible stewardship of the scarce natural resources that are critical to the livelihoods and well-being of local populations. Cooperation – Creative cross-sector partnerships between governments, companies and civil society can play a key role in overcoming barriers and unlocking solutions to advancing both economic development and environmental conservation. How Green are the World’s Cities?